Complete your Tomahawk sports equipment with the Tomahawk accessory. 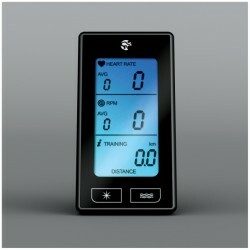 The Tomahawk bike computer informs you about important training data while doing your cycle training on an affordable Tomahawk indoor cycle. Thanks to the Tomahawk Cycle Well module, overweight persons, seniors as well as persons with back pains can comfortably use a Tomahawk indoor cycle of the E and S series.